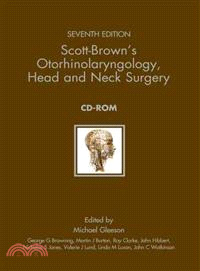 Scott-Brown's Otolaryngology is used the world over as the definitive reference for trainee ENT surgeons, audiologists, and trainee head and neck surgeons, as well as specialists who need detailed, reliable, and authoritative information on all aspects of ear, nose, and throat diseases and treatment. This new edition has been fully updated by an international team of editors and contributors and is highly illustrated in color throughout. The majority of the chapters are evidence-based and each contains useful features including key points, best clinical practice guidelines, details of the search strategies used to prepare the material, and suggestions for future research. The stand-alone CD-ROM contains the same content as the print edition, is searchable, and has references linked to PubMed. It provides trainee surgeons (ENT and Head and Neck), audiologists, and ENT physicians with a more portable version of this extensive reference work, and access to downloadable figures, bookmarking, and annotation tools. Michael J. Gleeson is Professor of Otolaryngology and Skull Base Surgery at the Institute of Neurology in University College London. He practices at the major teaching hospitals of Guy's, Kings and St Thomas' and the National Hospital for Neurology and Neurosurgery. He is also Honorary Consultant Skull Base Surgeon to the Great Ormond Street Hospital for sick children. Nicholas S. Jones is Professor in the Department of Otolaryngology, Queen's Medical Centre, Nottingham, UK. Martin J. Burton is Consultant Otolaryngologist at The Radcliffe Infirmary, Oxford, and Honorary Senior Clinical Lecturer at the University of Oxford, Oxford, UK. Ray Clarke is an ENT consultant at Royal Liverpool Children's Hospital, Alder Hey, Liverpool, UK. George Browning is Professor of Otorhinolaryngology at the MRC Institute of Hearing Research, Glasgow, UK. Linda Luxon is a Professor in the Department of Neuro-otology, National Hospital for Neurology and Neurosurgery, London, UK. Valerie Lund is Professor in Rhinology and Honorary Consultant ENT Surgeon at the Royal Free and University College Medical School, University College London and the Institute of Laryngology and Otolaryngology, London, UK. John Hibbert was formerly at the Department of Otolaryngology, Guy's Hospital, London, UK. John Watkinson is Consultant Head and Neck and Thyroid Surgeon, Queen Elizabeth Hospital, Birmingham, UK.